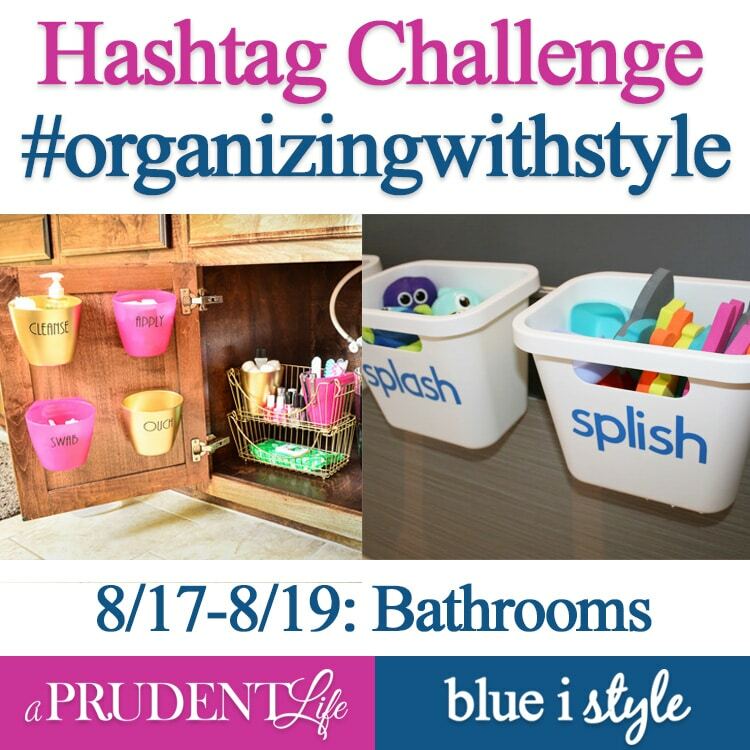 Welcome to week 2 of #organizingwithstyle! 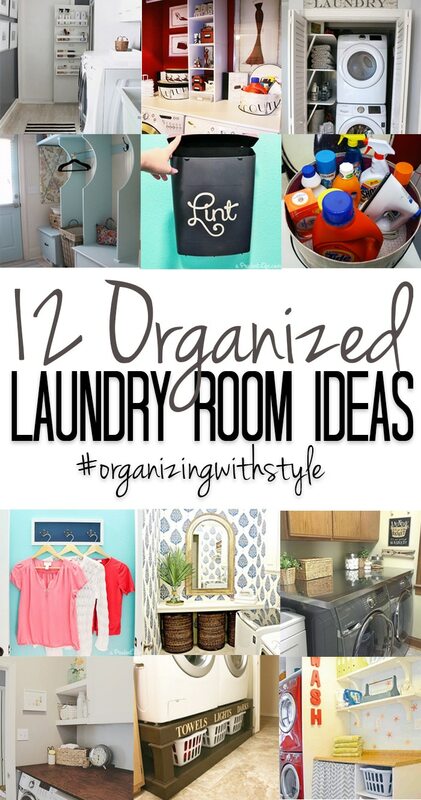 This week is all about LAUNDRY SPACES – big, small, we’ve got them all! 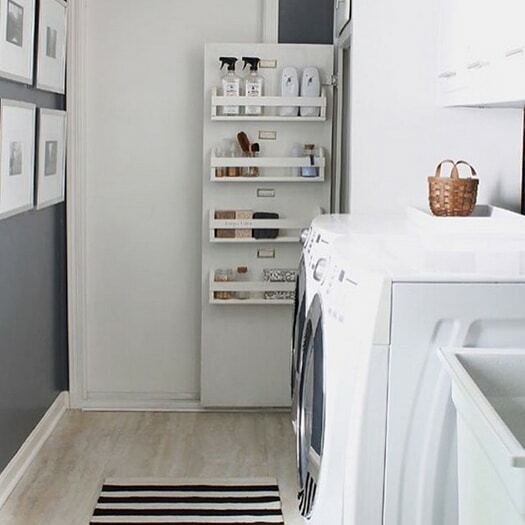 All last week, Instagram users shared photos of their laundry rooms using #organizingwithstyle. 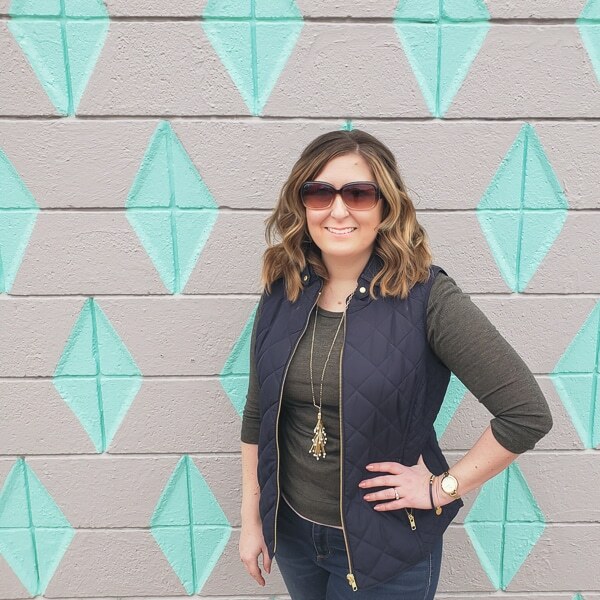 Angela from Blue i Style and I had the fun, but tough, job of picking the best of the best to share as inspiration for you. If you want to submit a picture next week, the theme will be BATHROOMS and we’d love to see yours. You don’t need a blog to play! 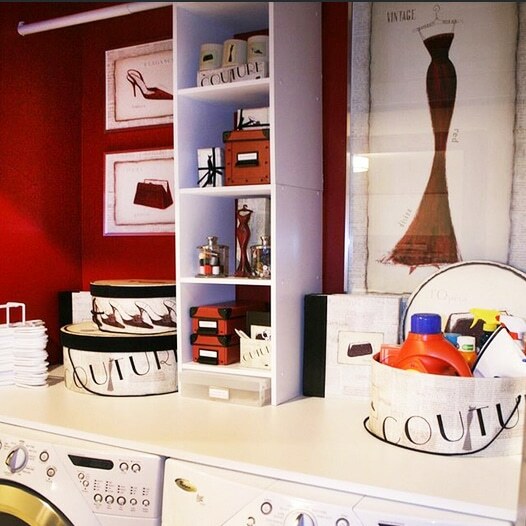 Our absolute favorite laundry room had the perfect balance of organization and beauty. Ursula from Home Made By Carmona added one of my favorite organizing tricks – using the back of a cabinet door to add storage. Now she can easily access her most used products without cluttering a shelf. 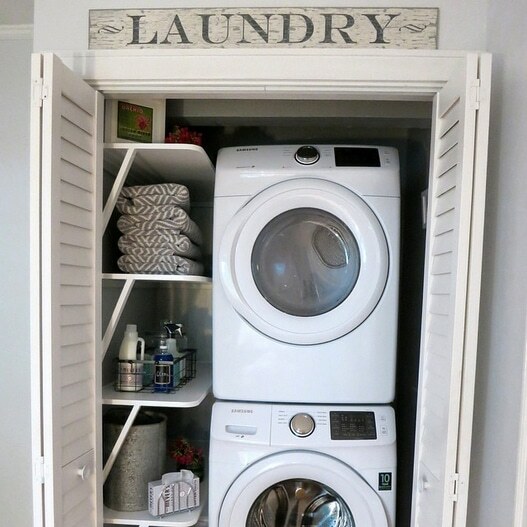 Speaking of adding storage – it’s a priceless commodity when you have a laundry closet versus a room. 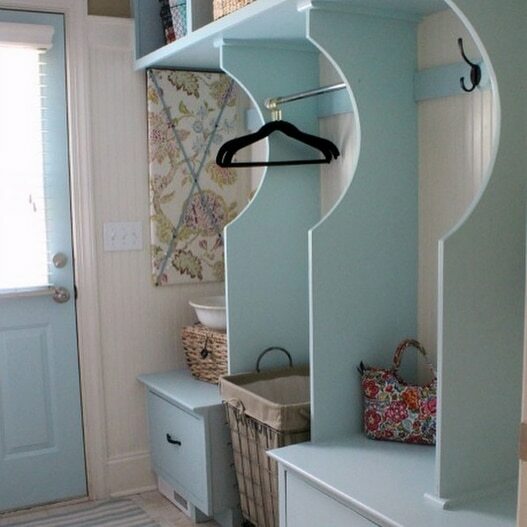 Using stackable machines freed up space to add shelving in this pretty closet by 2 Bees in a Pod. Blue i Style also has a laundry closet, but it’s configured a little differently. She added a large shelf across the machines to create a nice flat surface, and then went vertical up the middle for even more storage. So smart! Bettina from Oh Everything Handmade took the same concept even farther, adding a cabinet in addition to the shelving. Closed storage is always a good thing! I also love her use of baskets to corral smaller items. 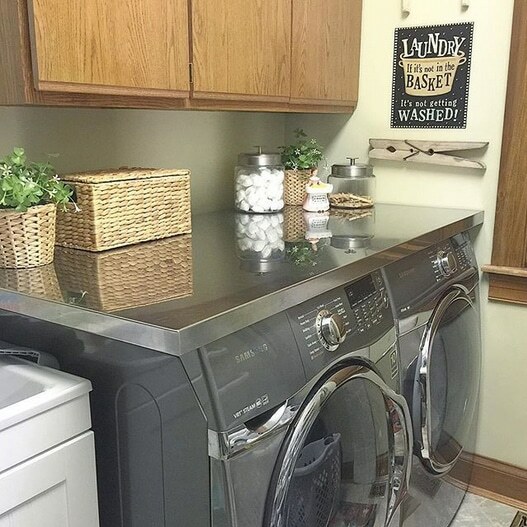 Michelle had a brilliant idea for her over-machine shelf – she used a stainless steel countertop from IKEA! Now the flat surface gives her space for pretty glass jars to hold not so pretty things like laundry pods. 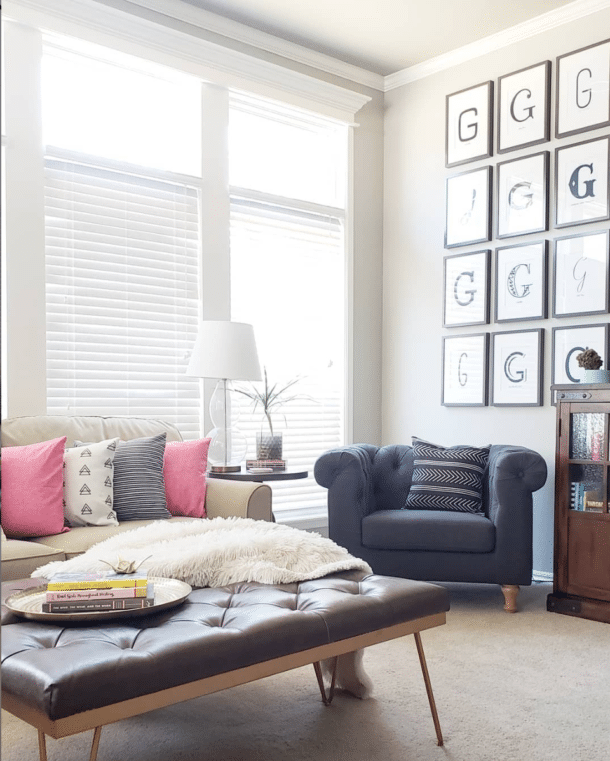 Liz from Smart Girls DIY added all the prior tips together into one super organized space. She’s got stackable machines to free up space, wall shelves, and built in room for laundry baskets. So much storage! 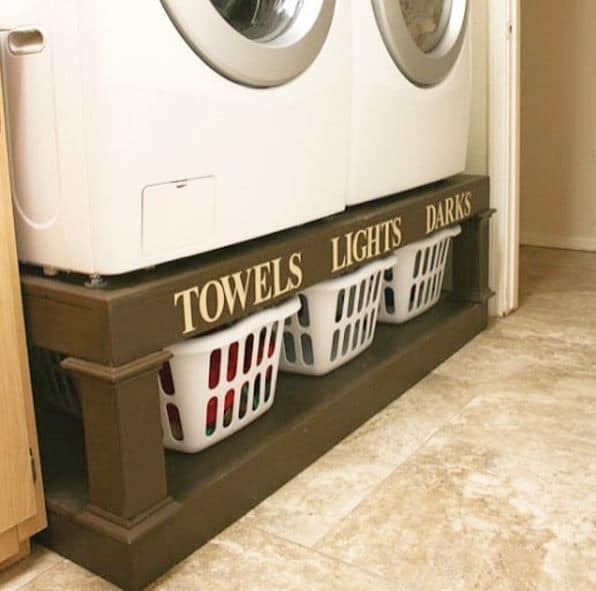 Speaking of laundry baskets, Katie from Addicted 2 DIY got organized AND saved money by making her own laundry pedestals. Now her family can sort laundry on their own, which makes laundry day one step shorter! 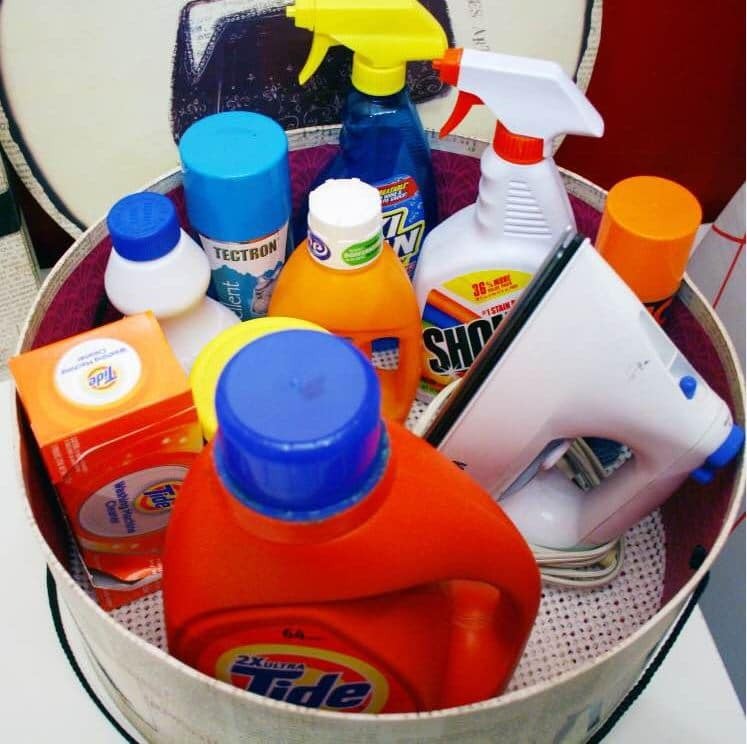 Sharon from Pretty Practical Home also shared her multi-hamper solution. 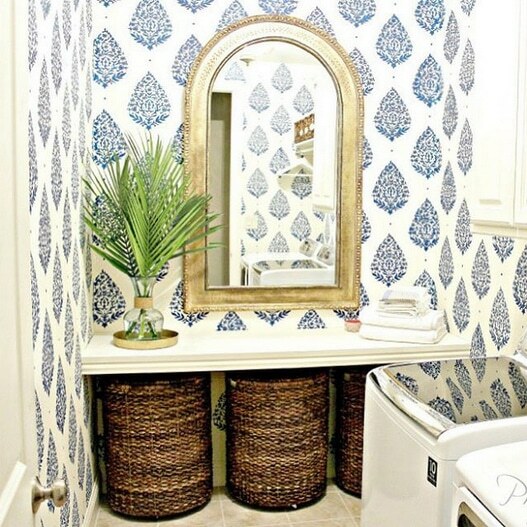 In addition to the pretty baskets, Sharon really amped up the style in this room with an unexpected mirror and pretty blue stencil. There were also some smaller scale ideas that can improve your function without a big room update. Angela from Blue i Style uses a hatbox to gather laundry supplies – it looks so much neater than having ten loose items. This next one is the idea I wish I would have come up with at our first house where we had no room to hang clothes fresh out of the dryer. 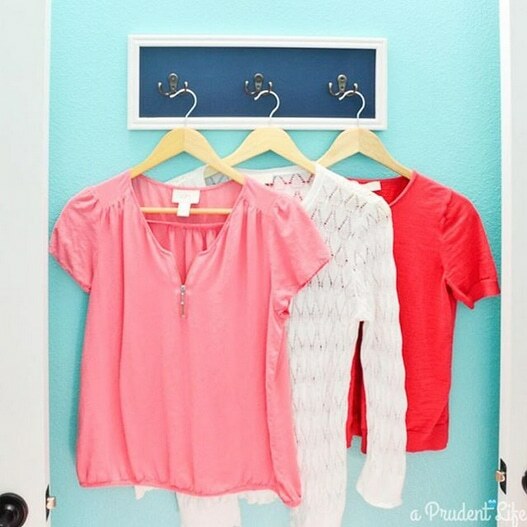 Adding hooks to the wall created enough space to hold almost an entire load of laundry on hangers. It’s amazing! I wish I could say I planned it that way, but the hooks were a clearance find at Target and I realized they fit perfectly between the doors. Dumb luck! The other unique organizing spot in my own laundry room is the wall mounted trash can. Before, lint and little trash from pockets cluttered the countertop. But, we had no floor space for a trash can. The wall mounted solution makes me happy every time I use it! The final favorite for this week is extra-dreamy! I’ve always wanted a big mudroom and this laundry/mudroom combo is full of organization. Amy from Atta Girl Says did a great job maximizing the space. Check out that hanging rod above the hamper! And here’s one last look at all 12! Which is your favorite? Don’t forget, the theme for the new week is BATHROOMS. Make sure you play along if you use Instagram! Great roundup! 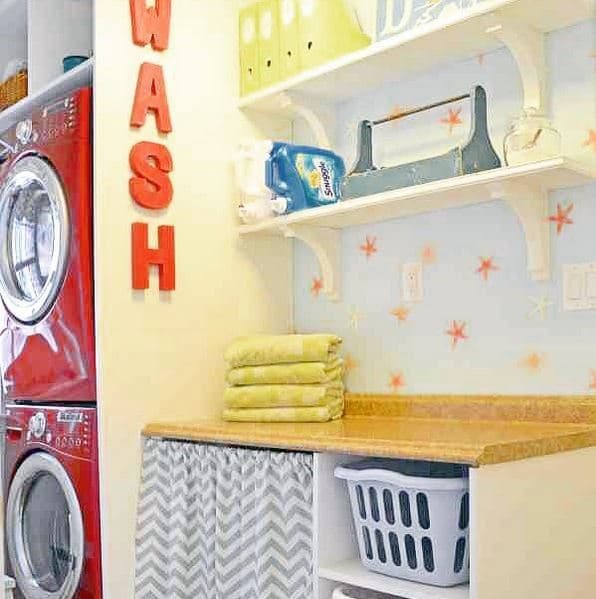 Thanks for including my beachy laundry room. 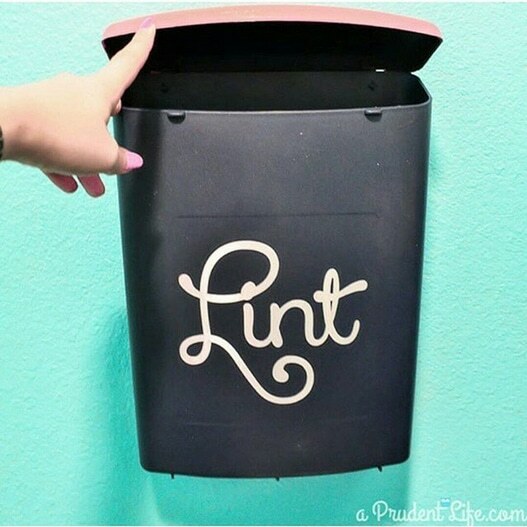 I am looking forward to some awesome bathroom organizing ideas! You are so welcome! Thanks so much for playing along! 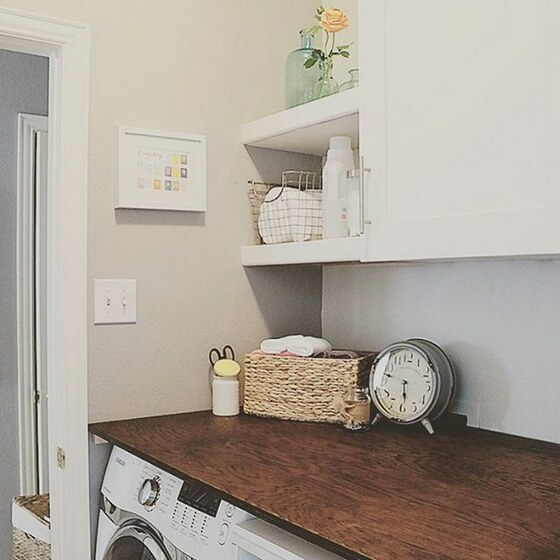 Such pretty laundry rooms! I am definitely inspired to jazz up our space now!